Snapchat is one of the many social media networks that connect people from all over the world. On this app, it is not uncommon to find chats becoming very sensitive and private in nature. Some more so that you might require the chat is deleted forever. You don’t want prying eyes to have access to pertinent information as well as a third-party hurting your image because of Snapchat chats. This article shares how to delete chats on Snapchat, what to do when you find yourself in such a situation and other ways to maintain and ensure your privacy is water-tight. Look out for the Snapchat logo at the top-center of the screen. Tap the Ghost icon and you can see your profile name and current score. There a gear (which means settings) at the top left corner. Go to “Account Actions” and tap on “Clear Conversations” on the ensuing menu to delete chats on Snapchat. Free Way to Clear Snapchat Caches, Crash Logs, Corrupted Files etc. Apps on iPhone generate enormous data all in a bid to make your user experience more fabulous. However, as time passes on, you these data compounds and begins to weigh on your device with effects such as slowness and low memory. For example, the Snapchat app is about 60 MB in size, however, if you check storage usage on your device, it is not uncommon to find Snapchat occupying close to 600 MB and 1 GB in some extreme cases. This is because like all other apps, it stores what iPhone calls “Documents and Data” which is just a fancy name for mostly junk files you don’t need. After having deleted Snapchat chats on iPhone, such “Document and Data” should also be cleaned to avoid privacy leak and free up iPhone. 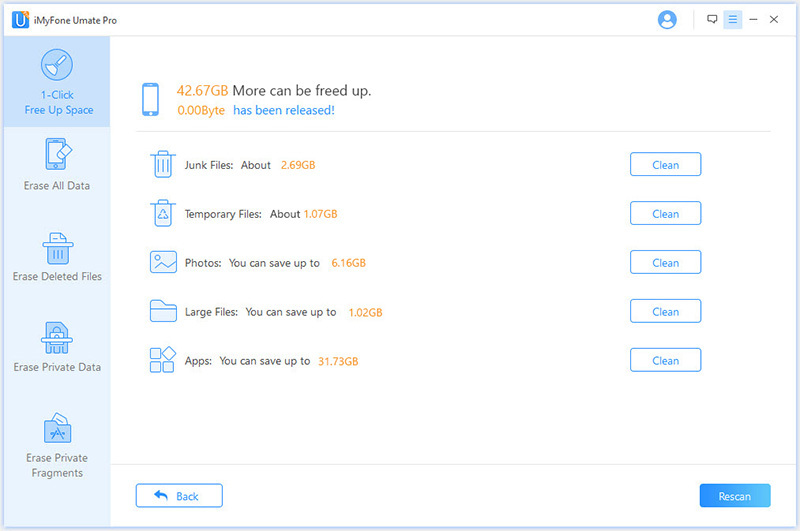 iMyFone Umate Pro or iMyFone Umate Pro for Mac can do this for FREE. Step 1: Download and run the free app, then connect your device to it. Ensure that iTunes is also launched. Step 2: Cick “Scan” to see how all the space on your device is being used. Step 3: From the result, click on the “Clean” button for Junk files. Step 4: On the next page, check or uncheck the junk files you want removed such as crash logs and photo caches. Step 5: Now, click “Clean”. After this, Umate Pro shows you the amount of memory you’ve saved and what more you can save. As mentioned earlier, manually deleting files only makes them invisible to the naked eye. What this means is that these files are still stored on your device’s memory and anyone with access to your device – stealing, sold, company’s phone is returned – and a recovery tool can unearth all the ‘dirty little’ secrets you tried to bury. This is a potential risk and perhaps time bomb depending on the contents you’re trying to hide. What can you do? 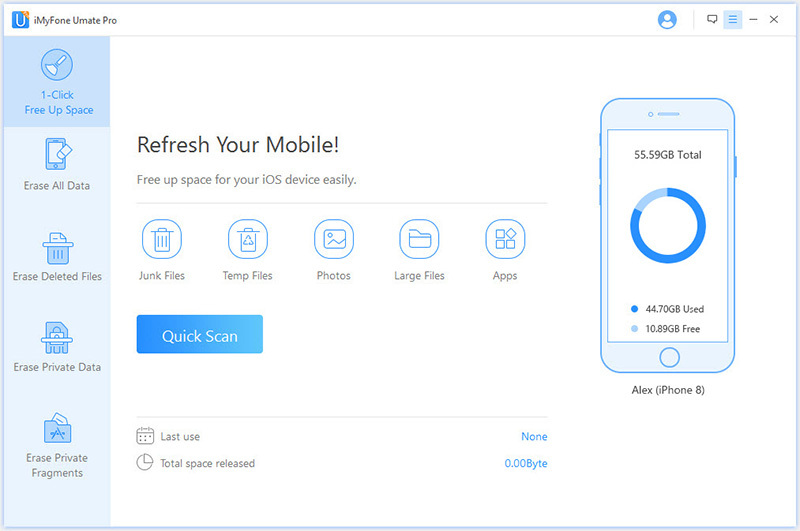 iMyFone Umate Pro’s “Erase All Data” is a tool that scans the nook and cranny of your iPhone’s storage and erases them all. This type of deletion is not superficial nor can it be recovered. No, all data erasd have been deleted forever and no tool – no matter how powerful – can find and recover them. 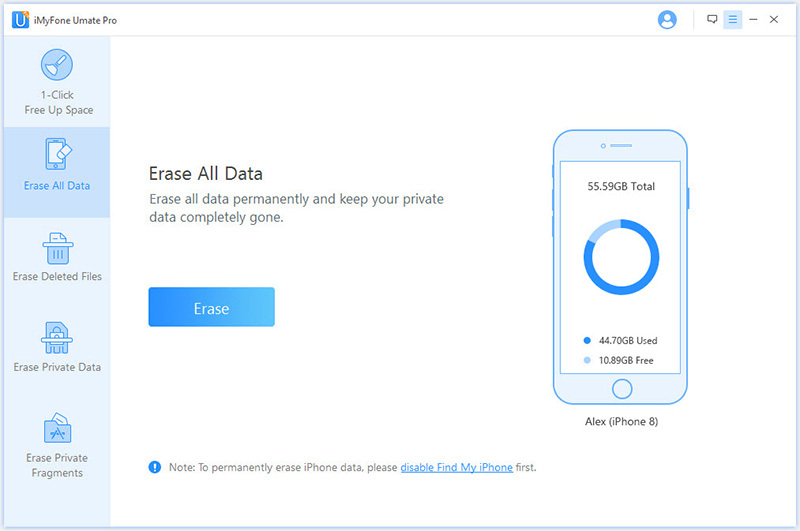 Use Umate Pro to Permanently Erase Snapchat Data: The steps of erase Snapchat data from iPhone is almost all the same as mentioned above, the difference is that you should choose the “Erase All Data” tab from “Home” interface. 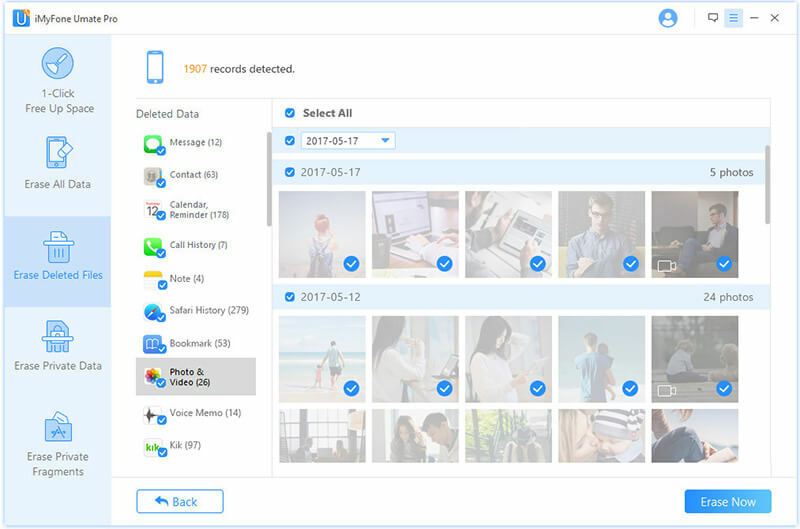 The features of Umate Pro goes beyond just deleting currently files, as it also has a feature that scans your device for previously deleted files even if it’s been a while. This ensures your privacy is kept intact. Furthermore, Umate Pro works on all kinds of data types and file types from photos to music, voice notes, WhatsApp messages, and much more. Why Should We Permanently Erase Files from iPhone? When you put up your device for sale perhaps because you want to get the latest version. When you are about to leave your old company and you have to return the official phone. It won’t make sense for the MD to be reading your secrets. Would it? When you’re sending it for repair or giving it away. There are many examples to serve as a warning in this regard. Nobody is to be trusted, hence the need to wipe your device before sending it for repair. If you’ll be suing the phone again, ensure you backed it up.